Perfect for custom branded cutting boards, corporate gifts, culinary school diplomas, and many other applications, we are excited to announce the addition of custom laser engraving services available on most of our residential and commercial grade cutting boards and chopping blocks. The laser engraving equipment enables us to reproduce crisp, detailed graphics including logos, type, and virtually any other graphic, directly onto the butcher block substrate. Laser engraved corporate branding: cutting boards for The National Cherry Festival’s culinary events. “We are excited about the addition of this piece of equipment to our custom fabrication process. We’ve already done some truly unique applications, including culinary school diploma cutting boards,” remarks Joe Barbercheck, Vice President of Sales & Marketing for the Wood Welded Companies. 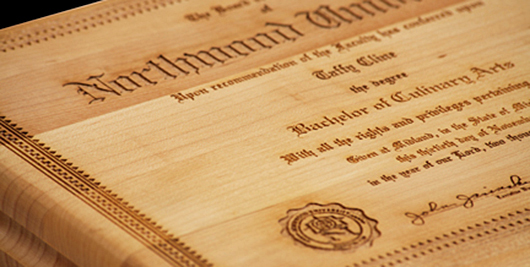 Our laser engraving equipment can accommodate boards and blocks up to 24″ x 24″. We are equipped to fulfill any size order— from one-offs to one thousand or more—with lead times based on the size of the order. For questions and pricing inquiries on custom laser engraved cutting boards and chopping blocks, please email us.